NAS Alameda had two runways: 07-25 (8,000×200 ft) (2,438×61 m) and 13–31 (7,200×200 ft) (2,195×61 m). Two helicopter pads and a control tower were also part of the facilities. In 1927, wetlands at the west end of Alameda Island on the east shore of San Francisco Bay were filled to form an airport (Alameda Airport) with an east/west runway, three hangars, an administration building, and a yacht harbor. The airport site included the Alameda Terminal of the First Transcontinental Railroad (California Historical Landmark #440). By 1930, United States Army Air Corps operations referred to the site as Benton Field. Pan American World Airways used the yacht harbor as the California terminal for China Clipper trans-Pacific flights beginning in 1935. The China Clipper terminal is designated California Historical Landmark #968. On 1 June 1936, the city of Alameda, California ceded the airport to the United States government a few months before the Army discontinued operations from the field. Pan American World Airways shifted its terminal to Treasure Island in 1939 for the Golden Gate International Exposition. Congressional appropriations passed in 1938 for construction of naval air station facilities for two carrier air wings, five seaplane squadrons and two utility squadrons. Appropriations were increased in 1940 for construction of two seaplane hangars and an aircraft carrier berthing pier, and naval operations began on 1 November 1940. Fleet Air Wing 8 began patrol and scouting missions following the attack on Pearl Harbor. In April 1942, the USS Hornet loaded at Alameda the 16 B-25 aircraft that would take part in the Doolittle Raid on Japan. 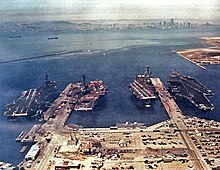 Carriers Coral Sea, Hancock, Oriskany and Enterprise at Alameda, in 1974. Alameda remained an important naval base through the Cold War. From 1949 to 1953, the Navy based the Lockheed R6V Constitution—the largest airplane ever listed on the Navy inventory—at NAS Alameda. The two prototypes regularly flew between nearby NAS Moffett Field and Pearl Harbor, Hawaii. During the Vietnam War portion of the Cold War and its later post-Vietnam era, the base was homeport to the aircraft carriers USS Coral Sea (CV-43)), USS Enterprise (CVN-65) and USS Carl Vinson (CVN-70). NAS Alameda also housed a major aircraft overhaul facility employing thousand of civilian employees that was known as Naval Air Rework Facility (NARF) Alameda and later renamed Naval Aviation Depot (NADEP) Alameda. The base was also the focus for northern California Naval Air Reserve operations after 1961, hosting various Reserve Force Squadrons attached to Carrier Air Wing Reserve 30 (CVWR-30), also known as CAG-30, equipped with aircraft such as the C-9 Skytrain II, KA-3 Skywarrior, A-6 Intruder and A-7 Corsair II, MH-53E Sea Dragon, SH-3 Sea King, A-4 Skyhawk, Sikorsky H-34 Sea Horse, CH-53 Sea Stallion, and P-2 Neptune. Runways were lengthened for jet aircraft, and the airfield was renamed Nimitz Field in 1967 following the death of Fleet Admiral Chester W. Nimitz. The base was closed in 1997 pursuant to BRAC action. Its runways were also closed and the airfield was not reutilized as a civilian airport. After the base closed on 25 April 1997, the USS Hornet was given to the former air station to be used as a museum ship, the USS Hornet Museum. The runways and remainder of the Alameda Naval Air Station can be seen at the end of Alameda Island in this aerial view of the port of Oakland, California. The television series MythBusters often conducted vehicle-based experiments on the grounds of the station (referred to on-air as the "Alameda Runway"), due to the extensive safety zone that could be set up around the test site. For the same reason, this location has been used as a checkpoint for the Bullrun rally race; the lengthy airstrip allowed for the staging of a challenge involving chasing a semi-trailer. A two-mile freeway loop was constructed on the base for the filming of a lengthy car chase sequence for the movie The Matrix Reloaded. The loop cost over $1.5 million to construct and was used solely for shooting the film's chase scenes (a seven-week-long process) before it was demolished. The route is still visible on some aerial photography on the former 07/25 and 13/31 runways. Since 2000, the city of Alameda has been planning the redevelopment of the former Naval Air Station, now known as Alameda Point. Complicating the redevelopment are several constraints: land-use constraints consisting of Tidelands Trust; soil and groundwater contamination; wildlife refuge buffer requirements; geotechnical issues; 100-year flood plans; institutional and contractual constraints with Alameda Measure A, the Alameda Naval Air Station Historic District and existing residents and leases. In August 2001, Alameda selected Alameda Point Community Partners (APCP) as the master developer for the property. APCP was a partnership of financier Morgan Stanley, Shea Homes of Livermore, Centex Homes of Dallas and the Industrial Realty Group. The development was estimated to cost $2 billion and take 15 years to complete. Alameda Point Community Partners was selected over Catellus and Harbor Bay/Lennar, and signed a two-year exclusive negotiating contract as the property's master developer. By 2005, only Shea Homes and Centex Homes were working on redevelopment plans, and a Preliminary Development Concept called for building 1,700 homes on the site. In July 2006, the City of Alameda and the Navy agreed to a $108 million purchase deal. In September 2006, APCP decided that it would not move forward with the development plan identified in the Preliminary Development Concept and withdrew from the project. In May 2007, the city selected SunCal Companies as the master developer from a field of five applicant firms that sought to develop 770 acres (310 ha). In July 2007, the city and SunCal entered into an exclusive negotiating agreement as SunCal began to gather community input and develop preliminary plans. In August 2010, the Alameda City Council voted to terminate the exclusive negotiating agreement with SunCal and halt its proposal for the former Naval Air Station. Various reasons were cited in the staff report leading up to the vote, including the developer- and city-initiated ballot measure related to the project that was defeated in February 2010 by a margin of 85%. NAS Alameda was listed as a Superfund cleanup site on 22 July 1999. 25 locations on the base were identified as needing remediation. The largest of the individual locations is the West Beach Landfill which occupies approximately 110 acres (44.5 ha) in the southwestern corner of the base. Tests of the landfill indicate polychlorinated biphenyl (PCB) contamination. ^ a b c d "California State Military Museum". M.L.Shettle. Retrieved 2011-08-02. ^ "Alameda Naval Air Station (historical)". Geographic Names Information System. United States Geological Survey. Retrieved 3 May 2009. ^ Gordon, Devin (30 December 2002). "The Matrix Makers". Newsweek. Retrieved 1 March 2008. ^ "NPL Site Narrative for Alameda Naval Air Station". National Priorities List. United States Environmental Protection Agency. 24 February 2006. Retrieved 10 August 2007. Wikimedia Commons has media related to Naval Air Station Alameda.